“We set off in darkness from Horton in Ribblesdale at 6.40am. It was pretty cold and we were all jealous of Alfie’s warm fur coat. Alfie was our mascot and he is an old English sheepdog that belongs to Andrew’s father, who was our support team for the day. 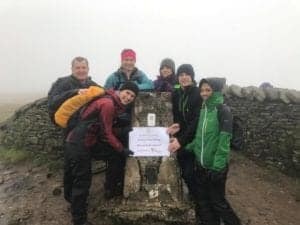 So wearing our headtorches we headed up Pen-Y-gent which was our first, wet and windy summit. We completed this is good time, though the scramble to the top was a bit hairy, with the strong winds. At the top we had time for a quick photo a drink and snack, before Andrew was cracking the whip for us to move on. We then had a very long walk across a broad grassy plain to our next stop. This path was very boggy and very muddy, and we had some good fun leaping over the streams that were running over the footpath. We could see, the amazing Ribblehead Viaduct coming into view and Andrew’s Dad (with Alfie the dog) was waiting at the car with some dry socks and a hot cup of tea for us. Stopping for the drink and snack was pretty un pleasant as it was absolutely belting it down, but we all laughed and joked before paddling on. Whernside was next and whilst a more gentle slope to the summit, it’s quite a long walk on the loop round and it’s the tallest of all the peaks in Yorkshire. As we neared the top it became harder to carry on walking forwards, as the winds were buffeting strongly into our faces. The walk along the 3 km ridge got worse as the winds rose up to 70-80mph. We could barely stand for the summit photo and quickly carried on down the very steep and slippery descent into Chapel-le-Dale. Ingleborough was last – and certainly not least… One of the highlights was when Andrew nearly got blown off the wooden board footpath, which went over a huge area of flooding, He was on tip toes on the very edge of the path, staring into the abyss and said if someone had just poked him with a feather, he would have been going for a swim, which gives you an idea how bad the wind was! We finally took the short steep climb onto the summit ridge, which is a huge plateau. 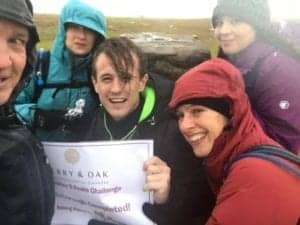 Apologies for the poor photograph on this one, it was so windy there was no one around to take our photo so we had to resort to a selfie! We certainly weren’t hanging around at the top and quickly set off on the home leg. 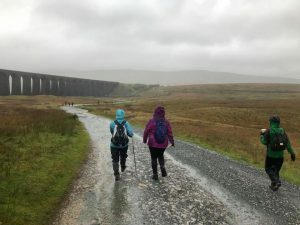 The last 2 miles felt like they just went on and on and on… we were so relieved when we eventually crossed the train track into Horton-in-Ribblesdale.